It gives a reality check for every sales opportunity, leading to higher close rates and reflects the DNA of a winnable sales opportunity. The App enables companies using Salesforce, to more effectively Qualify, Commit and Close sales opportunities. 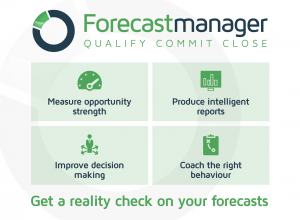 Forecastmanager realises a long term vision of Julian Clay, the founder of Sales to Success. how continual sales growth is achieved. This has been leveraged in the Forecastmanager App which is fully native to and integrated with Sales Cloud. The Apptituda team have been great. From our first meeting through every engagement, they have worked hard and with real conviction. They have guided me successfully through every stage of the journey. The quality of their go-to-market advice, software development and the ease at which we were able to achieve Security Review success, to Forecastmanager being listed on the Salesforce AppExchange and ready for sale has been excellent. I asked for their help in taking the App to market and I’ve asked them to provide support for the app going forward. I thoroughly recommend working with Stuart and the Apptituda team. This entry was posted in App Development, Go To Market, Sales, Salesforce Development, Software Development. Bookmark the permalink.